Yay, I got new earrings... sort of. Often, people give me all sorts of jewelry goodies for recycling. Some pieces are so yesteryear, others may be broken or missing parts. And then, there's bling that is just not the owner's style. I got this pair of earrings about a month when one of my neighbors moved out and left a bag of jewelry and jewelry supplies. Chi-ching! The pretty things sat on my desk for about a month until today that I decided to update them and give them new life. 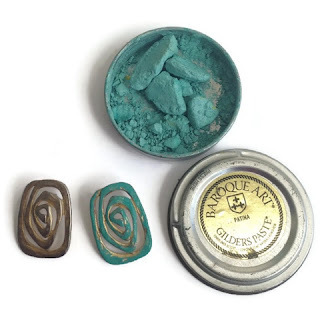 First, I decided to add a patina with Baroque Art Gilder's Paste. I simply apply it with my fingers. An alternative that can work as well is nail polish, but the color might peel at some point. 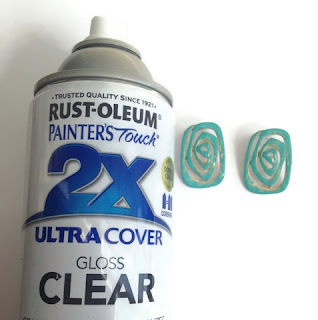 To protect the color, I sprayed them with Rust-oleum clear gloss and let it dry for about and hour in the sun. 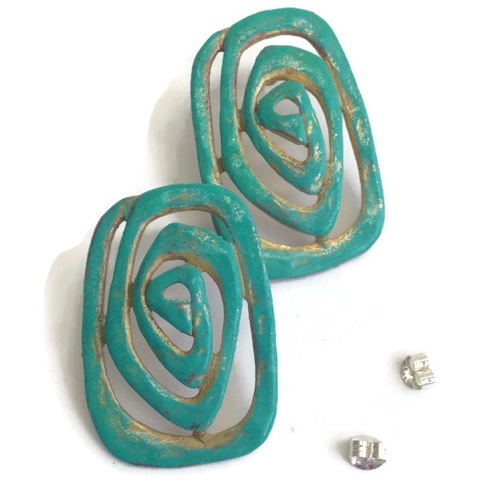 And there you have it, a new patina pair of earrings with earnuts. I could have stopped there but that would have been way to easy. If you know me, you know I like long earrings. I played a little with beads to see what would work. I was looking for color combination, texture combination, and light weight. The earrings were already a little on the heavy side and I didn't want them that much heavier. I opted for a thin, white, hemp cord and wooden and glass beads. I also cut out the earring posts (and filed/sanded the area to avoid any scratching on my skin) as I like my earrings to dangle. Plan A was to turn the earrings upside down with the widest side on top and to drill holes. When I started drilling, the top broke off as the earrings are made pewter instead of brass as previously thought. Plan B was to glue the one earring that broke off back together with E-6000 (which is great to glue metals. 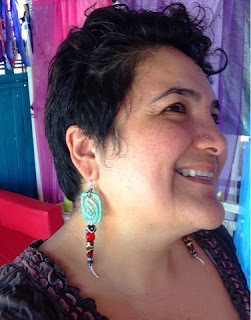 Note: Crazy Glue doesn't work on metals), then I used thin sterling silver wire and wrapped the thing gazillion times to both secure the earring and to make it dangle from the French earhook. The mishap made the earring design way better. I'm stoked with the end result. Perhaps you have a pair of earrings that needs updating. Go ahead try it, there's no right or wrong just make sure that you have fun through the entire process -even when you mess up. Share your pics with us on Facebook or Instagram. If you need me to help out, don't hesitated to hit me up. 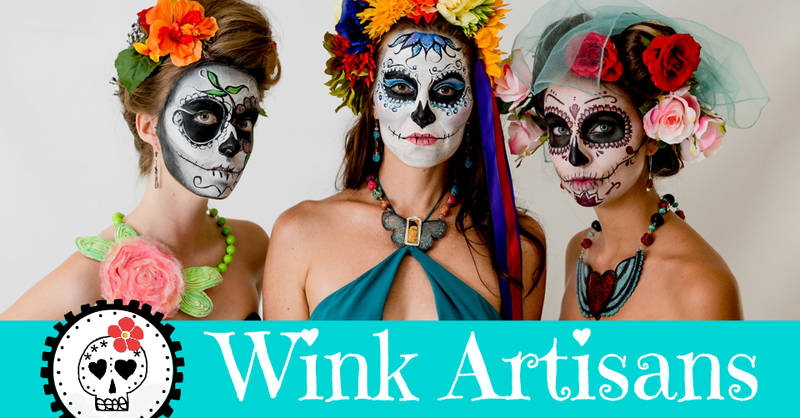 By Sol at Wink Artisans,maker of stunning, artisan jewelry. 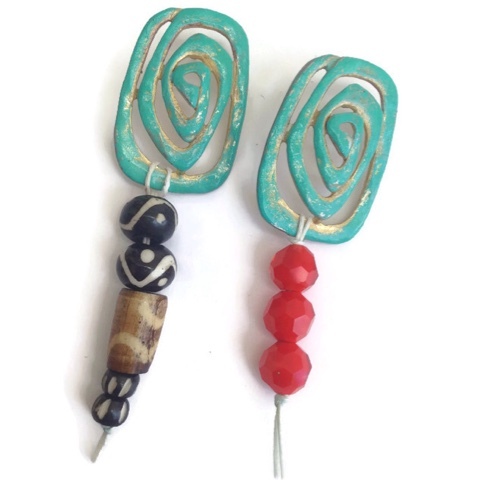 Shop our curated collection of Natural Hair earrings and accessories. Show pride in what grows from your crown. afro pick earrings Explore our curated collection of Ethnic Earrings. 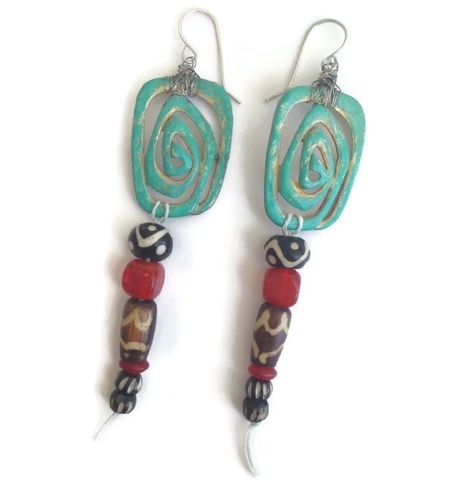 Browse our Afrocentric, Natural Hair, Map of Africa and Nefertiti earrings. 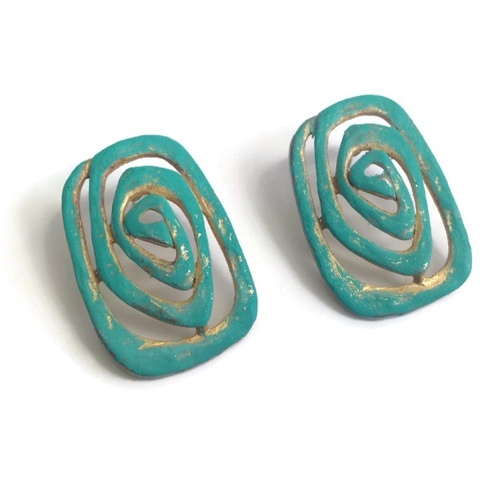 Tons of earrings at great prices. 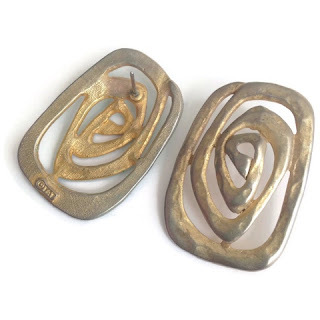 Moreover, they are included in some of the great jewelry collections of famous celebrities and great figures of the past. Various valuable stones like diamond, topaz and gems can be attached to them to make them look more attractive and eye catching. Fantastic post.Thanks For share this post with us. with out your bohemian impressed look. try and keep one's eyes off from wear that's too saggy and polish your look with signature bohemian boho jewelry jewellery items. 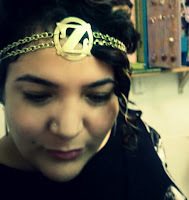 Feather jewellery is one nice route to travel once selecting jewellery for your bohemian look. Another nice plan is bangles.